Mixing quality with affordability, the Petersfield is a good budget pocket DAB radio. 2018 Update: There is a new version of this radio available, the Majority Petersfield-Go. 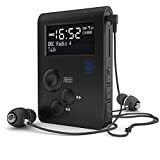 If you’re looking for a small, portable DAB radio you can fit in your pocket, the Petersfield DAB Radio could be a good choice. 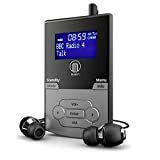 It’s one of the most popular pocket DAB radios in the UK at the moment thanks to its impressive range of features and budget price. Let’s take a closer look. The Petersfield DAB Radio offers impressive performance for the price. It’s simple and easy to operate, and is small enough to fit in your pocket meaning you can take it with you on the train or while going for a walk. It’s very light, so you’ll hardly notice it’s there. The sound quality depends on the headphones you use, and the headphones included aren’t particularly high quality. You’ll probably prefer to use some different earphones. DAB reception is good but will vary depending on where you use it, and will probably break up at times. Setting preset stations is a bit fiddly at first, but you will get used to it after a while. The Petersfield radio’s battery life is good at roughly 9-10 hours. DAB radios tend to have worse battery life than FM radios, so 9-10 hours isn’t bad at all. Doesn’t accept regular batteries, so if the built-in battery dies while you’re out, you can’t replace it. Doesn’t pick up DAB+ stations, only regular DAB radio. This means you can’t use it in European countries that use DAB+ rather than regular DAB. If you want a high-quality DAB/FM radio you can take with you while you’re on the go, the Majority Petersfield is an excellent choice. It’s also great for using around the house and in the garden. It’s very light and will fit easily in your pocket. 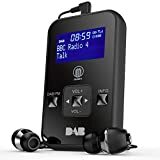 This portable DAB radio comes in an attractive gift box, so it makes a good present for any radio lover in your life. 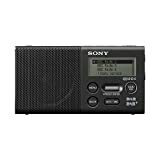 You can see some of the Petersfield DAB/FM radio’s main competitors in this roundup of pocket DAB radios. The most similar product in terms of price and features is probably AZATOM’s Pro Sports S1 DAB/DAB+/FM pocket radio . One of the main advantages of the Pro Sports S1 is that it offers up to 60 preset stations (compared to the Petersfield’s 20). Another similar radio is the Majority Romsey, which is in the same Majority range of radios as the Petersfield. It’s quite similar to the Petersfield, but comes with a built-in speaker which you might find useful if you don’t like using earphones.